Another week…another new recipe to try! While trying to figure out what to make for dinner tonight, I stumbled upon some boneless-skinless chicken thighs in the freezer. I know most people shy away from dark meat chicken and opt for the white breast meat, but I love the juiciness of chicken thighs, especially when grilling. Of course, I didn’t feel like going to the grocery store so the challenge of the day turned into what to do with them. I didn’t want boring ol’ BBQ chicken, so I started looking on Pinterest for recipes and took a little of this and a little of that from different recipes to create tonights meal. Combine the rub spices in small bowl and mix well. Trim off any excess fat from the chicken pieces. Pat dry. Toss chicken with the spice rub to coat all sides well. Use your hands to rub the spice mixture into the chicken well. Grill chicken for 3-5 minutes on each side, until cooked through. While the chicken is cooking, warm the honey in the microwave for a few seconds to thin it out a little and then add the vinegar. Combine well. 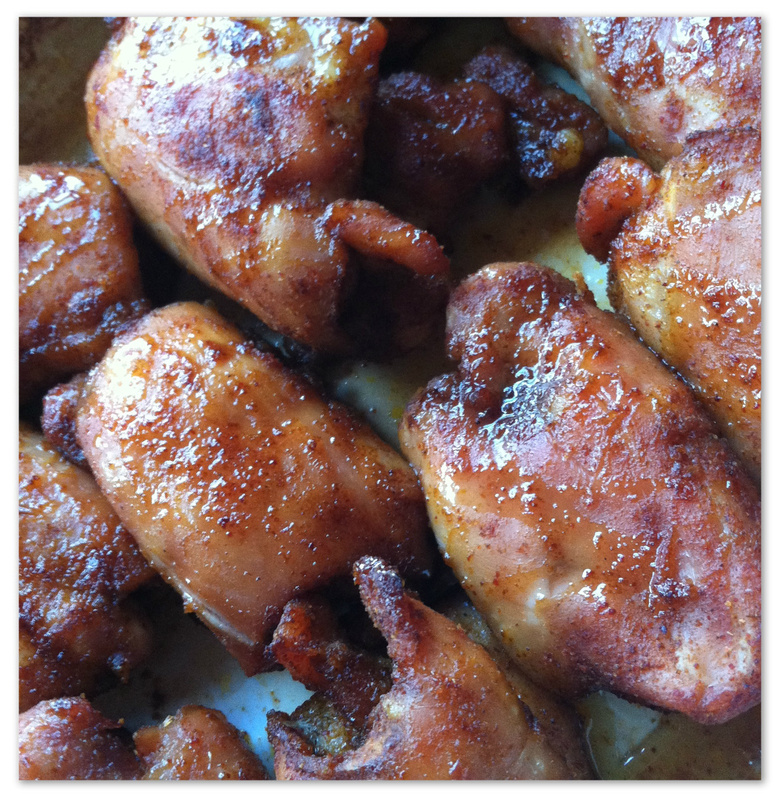 Reserve about 2 Tablespoons of the honey glaze for after the chicken has cooked. You’ll drizzle it over the chicken right before serving. Use the rest of the glaze to brush on the chicken in the final moments of grilling. Make sure you brush both sides! The glaze can get messy on the grill, and since it is technically sugar, you may experience some flare up as it drips into the fire. I served these with roasted veggies (sweet potato, zucchini, yellow squash and peppers) and some broccoli sauteed in garlic & a little olive oil.